Every morning, Serge Lutens writes for a few hours. The story he wrote about Billie Holiday, his staff say, wasn’t initially intended to inspire a perfume. In fact, they add, it’s the first time he writes the story he will give out with a perfume before the perfume exists. It is also the first time he claims inspiration from a muse. Lutens, who started out as a visual artist, has been sliding from scent to words, and in this gradual morphing into a writer, his writing has become inseparable from his fragrances. The former will soon be made available to the public on the brand’s new website: a strange medium of publication for an author, but why not? Some of the more interesting experiments in fragrance today go beyond the purely olfactory into a cross-disciplinary approach: in this case, the fragrance-story diptych (triptych, if you include the compilation of Billie Holiday songs included in the press kit) is what Serge Lutens emits. 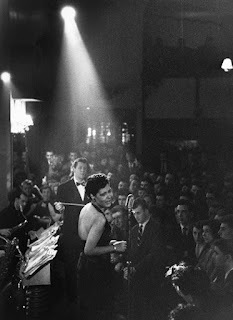 Is it somehow “cheating” to overlay Une Voix noire – the juice – with the beauty and pathos of Billie Holiday’s voice, of her legend? To enlist her ghost as Serge Lutens’s first avowed perfume muse? Is this substantially different from digitally conjuring Marilyn Monroe to tout Dior’s J’Adore in an ad campaign? A gardenia bush watered with rum grows on his “Tombeau pour Billie Holiday”, narcotic and mushroom-tinged as gardenias are wont to be – this effects persists throughout the development – though not as decadently ripe as Tom Ford’s defunct Velvet Gardenia. In keeping with the story’s retro vibe, there is something of Fracas in Une Voix Noire (both scents, after all, are named after sounds), though the “black voice” sings its torch song a couple of octaves lower than Fracas’ hot pink coloratura, pulled down by a balsamic haze of rum and blond tobacco. But the power, the volume, the headiness are in the Fracas spectrum… I’ve always thought that if tuberose was a corruptress, gardenia was a corrupted flower, but Une Voix Noire almost makes Tubéreuse criminelle feel like a debutante, past the latter’s initial weirdness. With Fracas, apart from the obvious white flowers, Une Voix Noire shares its strong muskiness and a sweet fruitiness that expresses itself in top notes that are almost strawberry-flavored, along with that characteristic “grape Kool-Aid” effect white florals naturally give off. A touch of burning rum darkens the sweetness out (an effect found in Olivia Giacobetti’s Vamp à NY for Honoré des Prés). On the scent-map, Une Voix Noire would also be in the same neighborhood as Calice Becker’s Sweet Redemption for By Kilian. Those expecting a realistic gardenia soliflore will not find it in Lady Day’s dressing room: it’s just part of the story… Is the scent made better by that story? Like photographs, recorded voices – Edison initially conceived the phonograph to preserve the voices of loved ones – or flowers growing in the Garden of Good and Evil, perfumes may resurrect the dead. But make no mistake: it is Serge Lutens who speaks through this "voix noire" -- not the voice of a Black woman, but the voice of black. The color of his mother's dress. Since I received a full bell jar at the launch, I’m willing to share. Just drop a comment and I’ll draw decant. Added October 2nd: The draw is now over. Thank you for your interest! I love Billie, interesting to see how this reflects her art. I wonder if the "mixed media" approach is a new trend, given perfumers' recently raised profile as creators. I'm think of Tauer's film collaboration of late, too. How close is this as a relation to his Cedre, by the way? Booze plus grape plus floral is pretty much Cedre on my skin, though that's tuberose rather than gardenia. I'd love to smell this one - Lutens does gardenia seems like such a natural pairing, it's almost surprising it didn't happen until now. Thanks for being the "nose on the ground" in Paris. Always good to get a heads up from perfumery central! Serge Lutens and Gardenia - that is bound to be interesting and I'd love to smell it. Billie is an exellent muse, I am curious to see how the inpiration is realized in the perfume. This must be the first gardenia offering from Serge Lutens. Do you think it's more tuberose than gardenia. Very interesting indeed. How is it compare to Strange Invisible Perfume's now discontinued Lady Day? Gardenia isn't on the top of my must-smell notes, so I wasn't really looking forward to this one... but your review and Victoria's review have really piqued my interest. The balace of the notes seems to be different from what I assumed (=a big honking gardenia soliflore with only minor additional notes). And funnily enough, I'm also really interested in the upcoming gardenia by Arquiste! Thank you for the review and the draw Denyse! Cheesegan, what's not to love? Sugandaraja, I was thinking more (apart from my own book/perfume contribution) of Olfactive Studio's collaboration of perfumers with photographers, or of a brand that will launched next year by the designer Philippe di Meo... Basically, my stance is that in certain products, you can't dissociate the olfactory from other aspects in a purist, Modernist, Greenbergian approach. As for the comparison with Cèdre, I haven't done a side-by-side but I'd say Une Voix Noire is much creamier and headier. Not at all the same texture. womo531, well, I hope you can smell in your mind it a bit too! Olfactoria, it is interesting indeed, with or without the muse, for lovers of floral orientals. Mikael, Victoria and I smelled the Arquiste (out in November I believe) in Florence, and were both smitten. It's a very, very different take, cooler and more "masculine". I would love to try this. Thanks for the draw. I love gardenia. Wow! A beautiful review of what sounds like an intriguing scent. I appreciate a story backing a perfume, but only if the story feels genuine and not a gimmick to boost sales. Expressing yourself in different media is a thing coming, I think, just think of Tom Ford directing A Single Man. Boundaries are made to cross over. Thanks for the draw, hope it's my time to get lucky :). As for stories backing perfumes, it's sometimes hard to tell marketing BS from the real thing, but that's no reason to dismiss them altogether. Kostas, I had to turn into an archeologist to dig up the Santal Majuscule press release from a teetering pile... The knight is more prominent, but he also says "c'est moi" about the princess. 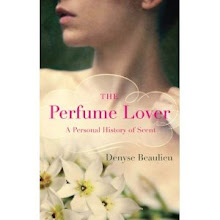 Interesting review, thank you Denyse! Have to admit that recent Lutens releases left me wondering if there is any hope for this brand. Luckily, Santal Majuscule turned out to be very interesting- and now finally gardenia perfume! What an interesting story! I became fascinated with Billie Holiday when the American film Lady Sings the Blues came out in 1972, with Diana Ross in the starring role. I would really love to try this Serge Lutens fragrance, having only recently become acquainted with his work (Fleurs d'Oranger, Feminite du Bois, Iris Silver Mist, La Myrrhe). Thanks for the wonderful drawing. So this is how Lutens does "celebrity fragrance". As a life-long fan of gardenia (happiest moment - scored a bottle of Tom Ford's Velvet Gardenia in a pharmacy in Rome this August) - I would like to be enetered in this draw please. Your excellent review puts me in mind of Back to Black by Kilian, the smoke, the alcoholic vapours, and the musical reference to a tortured musical genius. oh my! I have high hopes for this - a dark, edgy flower, what I was hoping Kilian's Jardin Noir series would be and was tremendously disappointed. Ela, in a post written ages ago, I suggested that part of the Lutens backlash might be due to the fact that his earlier work, being pioneering, created something of a shock which later work couldn't possibily reproduce. Also, there's so much more choice now we've all become increasingly picky, even blasé! Especially when aquatics are concerned... hmpf. Of course, personal taste comes into play as well, so I'm glad you've found a new Serge to love. Queen Cupcake, you've picked some of the very best Lutens to discover the line. I would encourage you to explore Bois de Violette and Boxeuses if you get a chance. Ilia, the thought of "celebrity fragrance" hadn't occurred to me, but you're right! And bravo for having scored the Tom Ford, I'm happy I bought it before it was discontinued (though it's so peculiar I can't say I reach for it very often). Thanks also for reminding us of Back to Black, an especially poignant inspiration given what happened afterwards. Sara, I've yet to attend the Kilian presentation of the new series. Still, given the perfumers involved, I'm not crossing it out! As someone very interested in how far language can and cannot go in explaining/describing smell, I have watched this launch with great interest! I'm also curious to know if you find yourself wearing it and loving it, or if you prefer its brighter siblings (Fracas, Vamp à NY, ..) that you mention in your post. In any case, many many thanks for the draw! Emily, it seems Lutens skips the description process entirely to veer off into narrative, which is an interesting option. Zazie, I don't wear Fracas at all. I have a full bottle of Vamp à NY so that would be the more spontaneous choice in that register. Like Victoria of Bois de Jasmin, I find Une Voix Noire is a scent I'm growing into, though I found it much stronger and more long-lasting than she did. Marla, thanks for bringing those up, as you know I'm not a close follower of the indie scene (and probably won't be able to manage it unless I win the lottery and can read/sniff 12 hours a day). I'm a little dizzied by this description. Gardenias are one of my favorite smells in the world - I have two gardenia plants on my back porch and when they deign to give me a bloom (not as often as I'd like) I can stand with my nose buried in it for minutes at a time. They really are narcotic. I wonder if anyone's ever made a good gardenia incense? Wouldn't that be great? Anyhoodle, please enter me in the draw. Oh, hey - is this coming stateside? Or will I have to love it from afar? I love gardenias and I'd love to test it- I was at Palais Royal last time in Paris, but, alas, too early for this one! Also Maria Candida Gentile has done a gardenia fragrance inspired by BH, have you had the chance to compare them? Amy, this isn't totally realistic gardenia, more of a composition around it, but yes, it's coming to the states since I belive the bell jars are now sold at Barney's NY. Lutens sounds like he's made a masterpiece. I love gardenias, and delight in picking them when I pass by a bush. It's incredibly heady, and oddly a scent of decay. Iodine, I like the Maria Candida Gentile a lot when I smelled it, but haven't done a side by side. Again, Une Voix Noire isn't really a soliflore so the intent is quite different. Eric, you're lucky to live in a place where they grow outside on bushes. I guess most of my gardenia kicks from flower shops! There *is* a hint of darkness and decay in Une Voix Noire, but it's not pushed to the max as in Velvet Gardenia (which I love too). I love jazz and Billie Holiday makes me smile & cry, all at the same time. I would love to try this fragrance. Thanks for the lovely article & draw. I'm awaiting a small split portion of this, so please don't enter me in the draw. Thanks for the lovely review. Hello , Denyse! Thanks for this draw! I'm very curious about this new Serge Lutens perfume. I haven't found yet a gardenia to adore. Could this be the one?Sounds very likely, at least from your description. Sweet Jesus I must try this! This could potentially break my "No more blind buys" rule. Gasp! would even buy it now... but better wait.... even though your review has caused some serious cravings... White flower and Serge... Love! Your review has made me very curious to try this- I have been reading your blog for some time now, but this is my first comment. 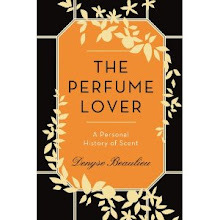 I really appreciate your writing, and your expansive/conceptual approach to thinking about perfumery (rather than a simply breaking down the notes- which I often find a reductive way to approach the subject). I have learned a lot through your writing, so- thank you! mals86, then this is definitely up your (Tin Pan) alley and you did right to sign up for a decant! Ana, we'll be spoiled with gardenias this year since, as iodine mentions in an earlier comment, Maria Candida Gentila has also composed one called Lady Day, and Arquiste will launch Boutonniere in November. Between those three, I hope you'll find one to love. Cheryl G., I'll be brave for you : NO BLIND BUYS. If you don't win this draw, get a decant. Oh, hell... follow your heart! Guido, I know what you mean... Serge and white flowers is a pretty irresistible combination on paper. Scottie, I'm glad you de-lurked, and touched by your comment. I think breaking down notes is a major part of the learning curve and must be done, but as I wrote in an earlier post, it's interesting to go beyond that. Normally I would find this disingenuous but Serge Lutens is one of the few artists I can believe capable of 'possession'. I can actually see his heels lifting off the floor, in a good way. I appreciate artistes giving over to a muse. I'm eagerly awaiting this scent! And I don't even like gardenia all that much! A draw - wonderful! Fracas was my first perfume as a very young teenager -ya, I got started too early. Now when I smell it, it just isn't the same, but, I've been wanting something like it and haven't found it - maybe this is it!! Please enter me - how I'd love to try it! Denyse, thank you for offering this draw. The majority of my most favoured perfumes are florientals. Heady gardenia laced with rum and tobacco sounds exquisite. On a side note, I want to let you know that I really enjoy reading your blog. Many of the fragrances I have sampled that I've read about on your blog work wonderfully on my skin. My newest love being Boucheron EdP. Beautifully written essay, Denyse. Thank you so much for the draw. I love floral orientals. This one sounds like it is "Easy to Love". Musette, I believe Serge Lutens as well, and I find it really quite fascinating that's he unveiling/veiling through his writing. Melou, thank you. I'm happy I've helped you find fragrances to love -- Boucheron is quite dear to me! Gisela, I find it fascinating as well. His brand is so predicated on his person/persona... there's also the way I interpret it of course, but his short story also mentions death more than once. Jake, I always feel such a sense of responsibility when someone blind-buys on my recommendation! I think the Arquiste, which was conceived with men in mind, might be more of a fit -- you have to feel like you can rock a big sweet white floral! What a great review, there are so many Lutens non export that I still have to try and now I am adding one more to my already long list. d3m0lici0n, it's an undending task, isn't it? Good thing there are decant sites! It sounds amazing. I love big white florals. Sometimes I think i may be overpowering everybody with scent-Manomalia is a skin scent to me, and so is Annick Goutal's Tubereuse. I love gardenia-I have never smelt the real thing. I sometimes confuse tuberose and gardnia, and i am trying to learn to smell the difference. I have Cedre too, and while i loved my sample, having a whole bottle is proving to be a challenge. The first day I wore it I had a headache, and now every time I wear it I am reminded of my head ache. Maybe i will try wearing it on my ankles, away from my face. I am glad this is not the same as Cedre. Have a good weekend in Paris. I hope you go somwhere in a slinky bias cut dress and seduce everyone with your wit and intellligence! LCT, glad you enjoyed it. You're in! Carole, the main difference between tuberose and gardenias, to my nose, is that little mushroom-y facet in the latter, though that's also part of tuberose absolute (you'll have noticed it in the Goutal, which is almost nothing but). Odd you can rock Manoumalia and not Cèdre -- there must be an ingredient in it that sits badly with you, or else it's the headache association. Thanks for your wishes! I'm afraid I did all the week's slinking around yesterday evening at the 70th anniversary of the Société Française des Parfumeurs. The weekend will be dedicated to writing a piece for an exhibition catalogue. But that's good too! I'm not familiar wih Billie Holiday, but I would love to try Une Voix noire - I find perfumes with white flowers intriguing! This one sounds like it could take the part that was once one's heart. It could take all of you. Has Serge out-noired the current noir noire nights? On the darkest night Let The Voice Sing. 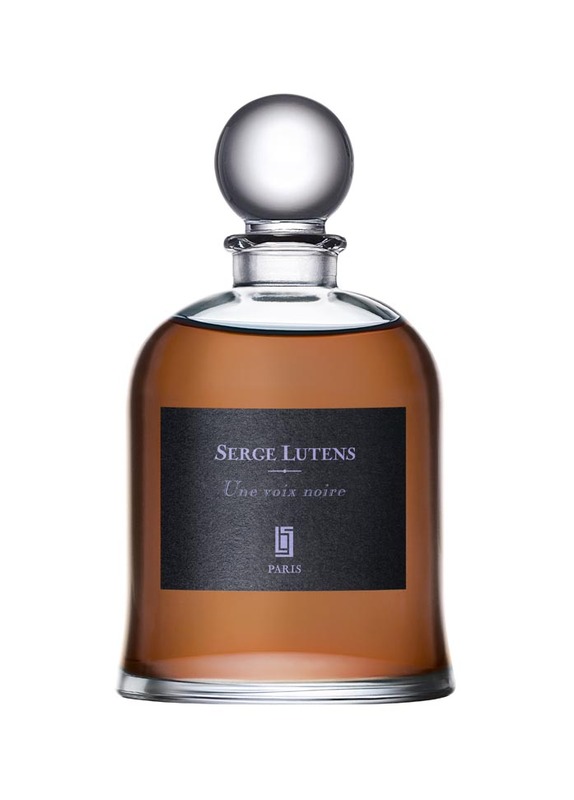 As always Serge Lutens's interpretation of note meanders in his experiences and is an entire journey for the senses. This sounds so intriguing, I would love to try this! So far I've only tried a few SL, but Iris Silver Mist, Bois de Violette and Tuberose Criminelle are favorites. Jordan, that's more like it. I think Lutens can lay more claim to noir than any other perfume house: after all, he's a man I'll love forever for conceiving a palette of four different black eyeshadows for Shiseido (note to Shiseido: bring them back and I'll be your slave). Eva S, to paraphrase what Spencer Tracy said of Katharine Hepburn in one of their movies together, " "there ain't much there, but what's there is cherce": good picks! This sounds admittedly more interesting than what I had imagined for a SL gardenia. I like his florals a lot. I also feel Tubereuse Criminelle is a bit of a debutante, that opening kind of falls aside to reveal a rather conventional scent. Would love to try this new one if I am still in time for the draw. What I find absolutely intriguing is that Serge Lutens writes for a couple of hours every morning! That's fabulous! My kingdom for this perfume in my hands. I've been exploring Billie Holiday lately, much to my enrichment. I can't stop listening to her Fine & Mellow, particularly a version taped for a 1957 CBS broadcast. I've been craving a gardenia to accompany my listening. Or my own creation at the piano. Lys, yes, you're still on time. Glad you agree about the lovely Tubéreuse Criminelle. Tomatefarcie, yes indeed... I should imagine he's writing a book. When I interviewed him for mine a year and a half ago, he said he was now more inspired by literature, and spent most of his time reading. Jared, I didn't know you were a composer... What I wouldn't give to play the piano! I wonder how lutens treated gardenia here. Would love to smell it! I imply MUST smell this! It's not at all surprising, coming from Lutens of all people, that the words, name and imagery that are all intrinsically tied to this fragrance release are so evocative, but even by his standards this perfume and all of it's description paints such a vivid picture. Then again I'm quite a lover of Billie Holiday, so all of this just speaks to me. It is quite interesting that this particular fragrance is inspired by a specific person, given Lutens' predilection for fragrances inspired by places or things. Needless to say I'm more than curious to find out how he's interpreted Lady Day's signature voice and being into scent. Ola, you're in the draw! Spike, true, it's unusual in the Lutensian oeuvre, though quite fitting, as you imply. Irina, I know what you mean, I get headaches from certain types of clean, bright, musky roses... You're in! Thank you for the draw anyway!